The psychological horror short film Paralysis recently announced its cast, which features an exciting mix of rising stars and familiar faces from TV, stage and film eager to bring this unique story to the screen. Fairweather takes the lead role of an emotionally fragile woman who moves into a new apartment. As she is plagued by a sleep disorder, she fears that she may be haunted by a supernatural entity. Fairweather has opened eyes across the industry through her work in the award-winning short film The Roe Effect, in addition to roles in Ordeel and The Girls of Summer. Fairweather will be joined in the film by Antoinette LaVecchia, who has starred in her own Off-Broadway play, I Loved, I Lost, I Made Spaghetti, in addition to guest roles on Law & Order, The Sopranos and an appearance in the 2014 film Deliver Us From Evil. Also joining the cast are veteran actor DK Bowser, who has appeared on Law & Order: Special Victims Unit and 30 Rock, and actress Nedra McClyde, who starred in the acclaimed short First Baptist and has made guest appearances on Law & Order: Criminal Intent and The Secret Game. The desire to see a new twist on a familiar genre was proven through the successful Paralysis Indiegogo campaign. Principal photography begins on the film in October in New York City. “We are so thankful for our many supporters, who expressed to us how much they were looking forward to seeing a classic horror film on the screen that features people from all walks of life and not just the stereotypical Hollywood faces,” producer Anthony Davis said. Paralysis is the third film from Williams and Davis’ production company, Vision 75/80 Productions. Their last short film, Contamination, was selected for eight film festivals, nominated for Best Short Film at the 2014 HBO/BET Urban World Film Festival and the 2014 BronzeLens Film Festival, and won for Best Actress - Drama at the 2015 Flager Film Festival. R. Shanea Williams is a native of Richmond, Virginia and currently lives in Queens, New York. She graduated from the University of Virginia in 2003 with a BA in English and received her MFA in dramatic writing (with a concentration in screenwriting) from New York University in 2008. Williams was a quarterfinalist in the 2007 Slamdance Screenwriting Competition, and in 2011, she was a top 5 screenplay finalist in the Urbanworld Film Festival Screenwriting Competition. 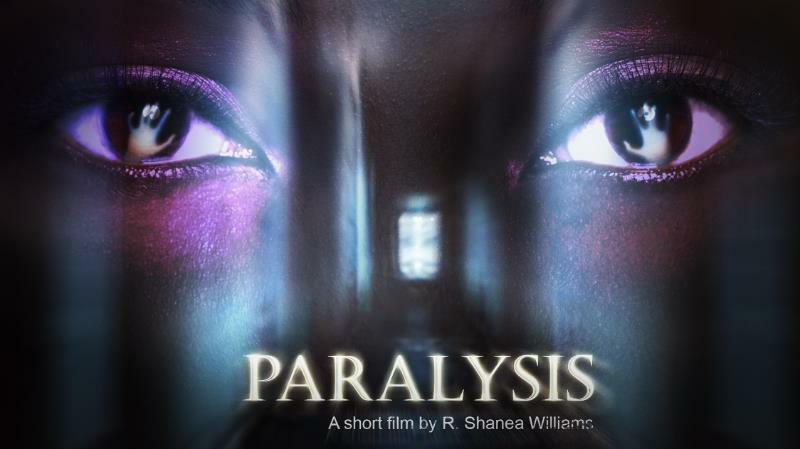 Paralysis is her third short film. Anthony J. Davis is an assistant production accountant in the film industry. The Richmond, Virginia native has worked on several film productions, including the Academy Award-nominated film Lincoln, Marvel’s Ant-Man and Prisoners. Mshon K. Pulliam is a freelance creative director and photographer. The Atlanta, Georgia native has worked with several established clients, including Chris "Ludacris" Bridges, Big Tigger, Kenneth Whalum III, Keshia Knight Pulliam and the non-profit organization Kamp Kizzy.